Photo Showing Memorial Exercises for Centenary of the Birth of James Cardinal Gibbons | Park View, D.C.
« Map Showing Federal Land in D.C. 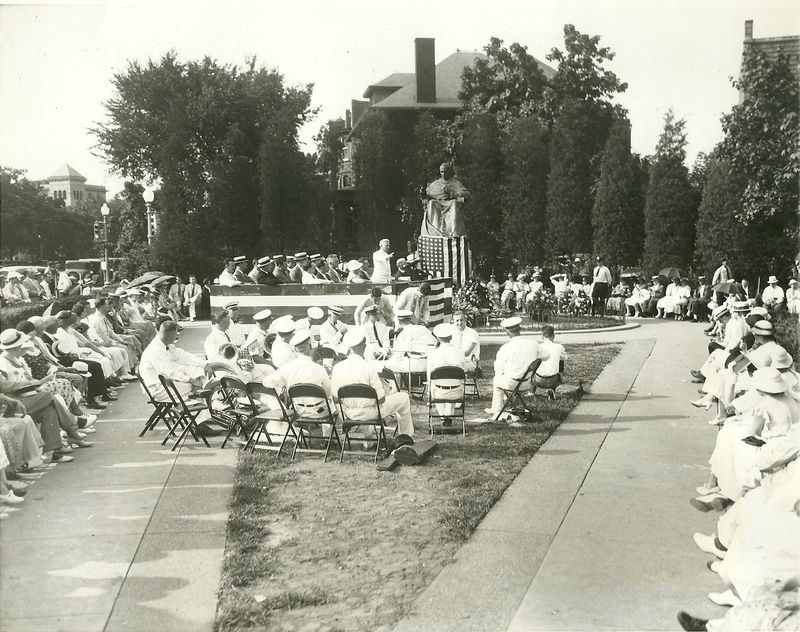 The photo above was taken on July 22, 1934, at the statue of James Cardinal Gibbons located at 16th Street and Park Road (in front of Sacred Heart Church). The event commemorated the 100th anniversary of James Cardinal Gibbons’ birth. Reportedly, two thousand person packed the small triangular park where the statue is located, the church steps and lawns and the verandas of nearby houses to hear Maj. General Paul B. Malone’s address at the occasion and view laying of wreaths. At the conclusion of the ceremony, which lasted less than an hour, the base of the memorial was a mass of flowers. The James Cardinal Gibbons Memorial Statue was authorized by Congress and President Calvin Coolidge on April 23, 1928. The piece was commissioned by the Knights of Columbus and cost, at no expense to the United States, $35,998. The piece was unveiled on August 14, 1932. This entry was posted on February 26, 2015 at 9:01 am and is filed under Historic Landmarks, History, National Monuments and Memorials. You can subscribe via RSS 2.0 feed to this post's comments. It’s going to be end of mine day, but beefore end I am reading this wonderful aryicle to improve my know-how. Great web site. A lot of helpful info here. I’m sending it to several buddiess anns additionally sharing in delicious. this site are in fact awesome for people knowledge, well, keep up the good work fellows. your presentation however I to find this topic to be actually one thing that I believe I might never understand. forward on your next put up, I’ll try to get the hang of it! I’ve a challenge that I’m just now running on, and I have been on the look out for such information. think on this, suppose you were to write a killer title? Just make sure that the house stays clean and secure while the owners are away. May I simply just say what a comfort to find a person that really understands what they’re discussing over the internet. sólo sі el género de interés de la gota. tɦis webpage’ѕ post tօ bе updated regularly. It contains nice information.